today's polish is Essie Dive Bar. i can't believe i've never put this one on the blog before, i've had it for quite awhile! it's a a teal shimmer in a blackened base. in some lights it almost looks completely black! it's similar to Pixi Evening Emerald, but it's far less sparkly and a bit darker. if i could only have one, it would be the Pixi... but i love them both!! in the bottle you can sometimes see what looks like a purplish navy duochrome around the corners... but that doesn't translate at all to the nail, sadly! the formula is a bit patchy on the first coat, but evens out beautifully on the second to full opacity. 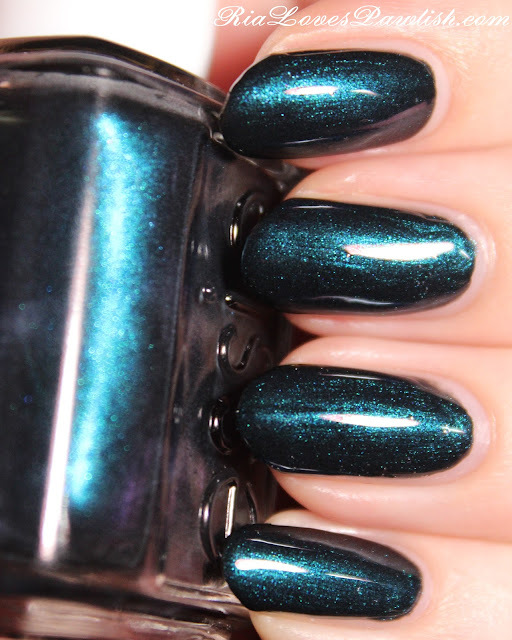 definitely add topcoat to make this polish shiny and bring out all the shimmer! two coats Dive Bar, one coat Seche Vite.